Dial Archive | Dial | Logo for An Era | One Lucky Guitar, Inc. 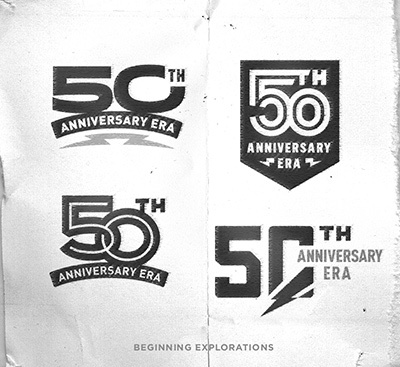 Recently, Carroll High School reached out to us for help to give their 50th Anniversary Era some visual punch. Why “Era”? Well, starting this year, they’ll be celebrating three consecutive anniversaries of different events: the last year of Arcola and Huntertown High Schools, the first year of Carroll High School, and the first year at Carroll High’s current location. To encompass this celebratory timeframe, OLG created a logo that hints at their current logo’s lightning bolt feature. They are, after all, the Carroll Chargers! Over the next three years, this mark will be used in publications, media, signage, celebrations, social media and apparel. The logo itself was made to be flexible, allowing differing subheads to correspond to the particular organization or club making use of the mark. We look forward to meeting with art and design students this upcoming school year to talk about the process and vision for the design. Congratulations, Carroll, on your impressive legacy!